Make this right now, throw onto a halved baguette anything that you’ve got in the fridge to make a wicked ‘pizza addict’ munchie. Preheat the oven to 230C (450F) mark 8. Chop the baguette into three and then split in half. Rub a halved garlic clove over the split baguette. Drizzle with olive oil. Put onto a baking tray in a hot oven for 5 minutes. 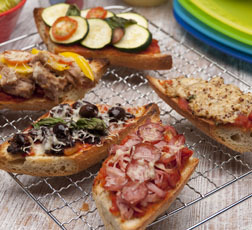 Spread pizza topping thinly over the hot bread. Top with the cheese and any other topping that you have in the fridge (see list below). Bake for a further 5 minutes. Sprinkle with dried oregano and arrange on a serving plate. This lamb risotto recipe comes from Meat Promotion Wales and it is a great way to use up any leftover lamb. With the addition of a few ingredients, it is simply delicious! You can also add vegetables past their best to this dish, for example, celery and carrots. Two of your favourite breakfasts combined! Simple, fluffy spiced muffins topped with crunchy granola - a perfect way to start your day. Do you end up throwing away the odd portion of chicken that’s been forgotten in the fridge? What a waste. You can end that today with these top tips for using up the whole chicken – saving money and helping the environment. It’s win-win. What would you do with a saving of £70 a month over the course of a year? Here are a few ideas for starters. WHAT’S THE TRUE COST OF SAVING FOOD? Discover how much using up the food you buy could save you at the checkout – plus a few bright ideas for spending the extra pounds. Take your rightful place among the nation’s food-saving heroes. See recipes, get involved and celebrate a love of food. Subscribe to the newsletter and get some tasty stuff every month. © WRAP 2018. The Waste and Resources Action Programme (which operates as WRAP) is a registered UK Charity No. 1159512 and registered as a Company limited by guarantee in England & Wales No. 4125764. Registered office at Second Floor, Blenheim Court, 19 George Street, Banbury, Oxon, OX16 5BH.